Interactive read-aloud is the foundation for instruction within a literacy rich classroom. Interactive read-aloud promotes the joy of reading, expands children's vocabulary, and increases their ability to think, talk, and write about texts that fully engage their interest. Participants in this seminar will learn more about the values of this powerful instructional context. They will learn how to use The Fountas & Pinnell Literacy Continuum to observe children for evidence of their reading behaviors, and how to use the Fountas & Pinnell Classroom™ Interactive Read-Aloud Collection Guide to engage children's thinking through high-quality texts. 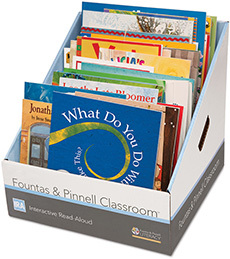 Become familiar with the Fountas & Pinnell Classroom™ Interactive Read-Aloud Collection of books, text set overview cards, and lessons.